Integrated Pest Management Database (IPMD 2000) is a relational database (MS Access) employing spatial properties through linkage to GIS Software. IPMD 2000 is designed to specifically support the New Jersey Fruit IPM program. IPMD is linked to a GIS Mapping software (Arcview GIS) so that database elements can be readily geo-referenced in high-resolution grower maps and also overlayed with other data layers. To evaluate the effectiveness and cost of their pesticide usage through standardized grower reports. To evaluate and demonstrate the impact of various IPM practices. To identify broad trends in pest populations and pesticide usage with its report summaries, graphs, and ad hoc query capability. Currently there are eleven types of data records (specific information) that can be input into the IPMD database. The eleven types of data that we can input into the database are: application records, pre-season application records, in-season application records, post harvest observations records, soil fertility, soil pH, tissue fertility, in-season trap counts, block practices, farm practices, and grower practices. A Grower Model can be queried on 4 levels (grower, farm, block, and trap station) so data collection records can be stored for each of these distinct levels. A Material Model (with active ingredient type, pricing, and function). 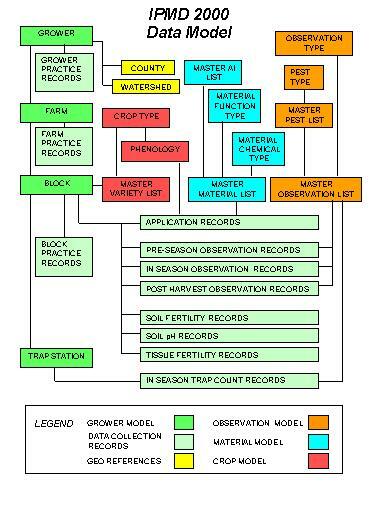 A Crop Model (includes phenology data as well as a master variety list of all apple, peach, pear, and blueberry varieties grown by New Jersey IPM practitioners). An Observation Model (details the pests under evaluation and the observation methods, eg., types of traps or collection methods). All fruit growers in New Jersey benefit from this IPM information. Growers who contribute participation fees get individual farm reports and recommendations. These Primary Participants realize the most direct benefits. Secondary Participants, or all other growers in the State receive summarized IPM information and recommendations through newsletters, broadcast faxes, articles, fact sheets, grower meetings, and the world wide web. Primary Participants currently manage roughly 50% of New Jersey tree fruit and blueberry acreage.